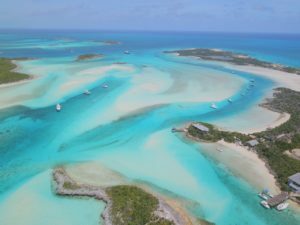 When you think of the Exuma Cays Land and Sea Park; you may think of a beautiful yacht, tightly nestled between two sandbars, and surrounded by the most incredible turquoise water- a scene worthy of a postcard. But, what you don’t think about, is just exactly how that yacht is secured in that perfect position. How close they are to being aground on that beautiful sandbar, yet will never actually be in danger of touching it. Recently with careful planning and implementation, the ECLSP has become the world leader when it comes to providing vessels with safe and effective mooring systems in a pristine marine environment. We currently have 7 active mooring fields spread throughout the park. Each mooring field is unique and special in it’s own way. 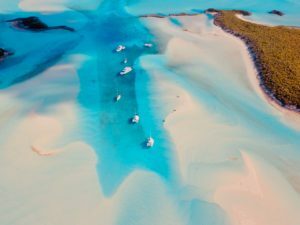 From Cambridge Cay in the south; known for it’s superb protection in all wind directions and proximity to fantastic snorkeling, to Warderick Wells in the central area; famous for allowing cruisers to step directly from their boat onto a pristine sandbar, to Shroud Cay in the North; where visitors can spend days exploring miles and miles of creeks and mangroves. Our mooring fields allow you to safely secure your vessel within close proximity to a plethora of incredible attractions, and each field offers it’s own special ‘to do’ list for our visiting guests. I love our moorings. I love all of our mooring fields- in fact, I can’t even choose a favorite. Since I was a kid, I had been visiting the ECLSP with my parents on their boat just about every single summer. After university, I came back through the ECLSP on various charter yachts where I was employed as crew. 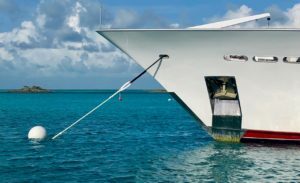 I understand the importance of a secure and protected mooring; and just what that means in providing peace of mind to a captain, an owner, and a guest. Working as Park Warden in the ECLSP, the opportunity to be involved with a park-wide project to replace and update every single mooring system was something that I was more than ready to support. The update of the park moorings was long overdue. Scheduled comprehensive maintenance of the moorings was a priority for the park and implementation of the project began in March 2018. Our park staff dove on every single mooring in the park; inspecting all components- including the in ground hardware, and also double checked depths and swing radiuses. As a result, some moorings were taken out of service and repairs were made to existing systems. Once all moorings were evaluated, an order was placed to ship in all the materials necessary to replace every single mooring within the park; and to add some new moorings. The coolest part about this project? Well, we aren’t just simply replacing every mooring. We’re completely revamping our mooring setup, and switching to a standardized system for park wide use. No longer will we have different styles of mooring setups- each requiring their own special components and knowledge for use and maintenance. Now, we will have just one, easy to maintain, easy to install, easy to repair system that is extremely safe, and way stronger and more rugged than anything used before. This new setup will see us switch from using rope down lines to chain down lines. We’ll be using ¾” galvanized chain, shackles, and swivels along with longer pennants made from 1 ¼” 3 strand; complete with chafe guard and thimbles. This new system is extremely reliable, and we developed it in-house after weeks of careful testing, and gathering a lot of input and suggestions from some of our repeat large yacht clients. We figured that if we can develop a system suitable enough to put the Captain of a 150’ yacht at ease, then that same system will be suitable for the average 40’ sailboat as well. No more ropes chafing. No more questioning just what lies under that massive amount of growth on the down line. Not only do these new moorings provide an incredibly higher breaking strength, but they will all also be subject to a strict inspection and maintenance schedule implemented by our new team of Park Staff based out of Warderick Wells, headquarters for the ECLSP. We also realize the need to install more moorings throughout the park; both for large yachts and small pleasure vessels. We’ve been carefully analyzing vessel movements and trends to determine where next to add in these additional moorings, and to highlight/prospect certain areas for potential mooring field development in the near future. Our end goal is to provide enough mooring systems, in all the right areas, so that we can minimize the need for vessels to anchor. Not only do moorings provide peace of mind, and eliminate the risk of dragging anchor to visiting cruisers, but they also protect our seabed. Moorings are instrumental in ensuring the underwater environment is preserved by reducing disturbance and damage to marine life. Both reef and seagrass areas are often subject to severe damage by repeated anchoring, and the dragging of anchor chains across the seafloor. 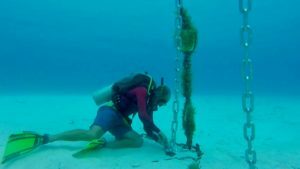 It is imperative that we continue to install moorings so that we can work to eliminate negative impacts to these very fragile seafloor habitats. We always get asked by visiting cruisers just what exactly lies below the seabed, what is holding their boat in that perfect position. Well, we use a few different anchors throughout the park. Most of our moorings use Manta-Ray plates. The Manta system is based on a system commonly used to anchor utility poles, and adapted for marine use. We use the Mantas in sandy areas the most common type of seabed for our mooring fields. Essentially, the Manta system utilizes a plate that is driven (vertically) into the seafloor using an underwater hydraulic jackhammer. The plate is driven 6-7’ deep into the sandy bottom, then an upward force is applied to ‘open’ the plate, and lock it into a horizontal position. The number and size of plates used depends on just how loose the sand is, and what size vessel the mooring is intended for. We use a variety of plate sizes, and many of our Large Vessel moorings utilize multiple plates in close proximity to one another. Additionally, we utilize stainless steel U-Bolts and Halas Bolts (eyebolts) in other areas of the park. 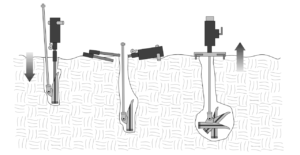 These bolt systems require underwater hydraulic drilling that allows the 18” stainless steel pin with welded crosspiece to be inserted, and then cemented in place. This system is used in areas where we have a solid rock bottom- common at snorkel sites and dive moorings. As of this writing, all 22 moorings in the Warderick Wells North Mooring Field have been replaced. Also, the 3 Large Vessel moorings in Cambridge Cay have been replaced, and mooring work continues throughout the remainder of the park. 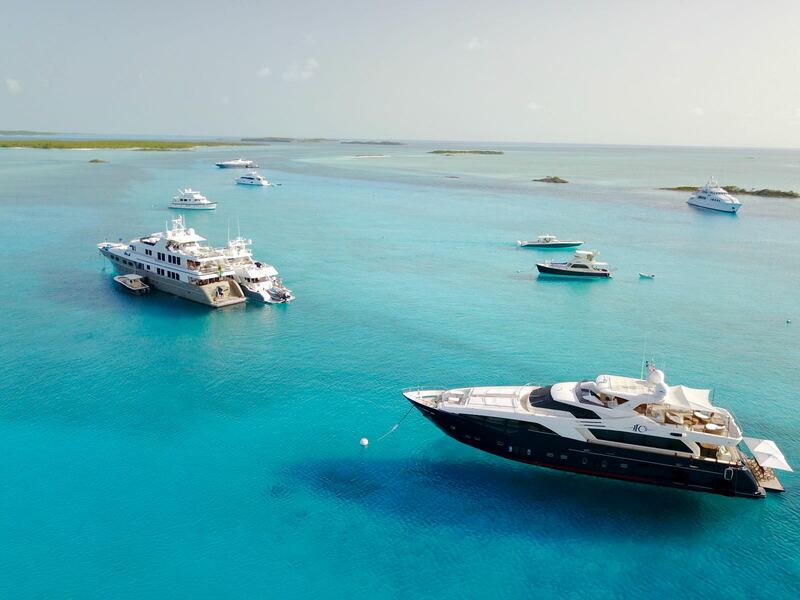 We’re excited to get the Hawksbill and Shroud Cay mooring fields up and running to their full potential, as we know these two fields were a priority for upgrades. Also, at the time of this writing, it’s important to note that despite our new mooring systems being installed and operational; we are still using our old style balls / temp rubber buoys (until our new shipment of balls comes in and we can switch them out). I know these balls may appear old and weathered; but they are not a structural part of the mooring system, and simply act as a float- and do not indicate the age or newness of the mooring system below the waterline. Please do support us as we continue to undertake this tremendous effort! We’re currently seeking donations to assist with our mooring replacement program. We have over 90 vessel moorings in the park, replacing them all is no easy task. In addition to the cost of materials, one must consider the time and resources involved in switching out these systems. I would estimate it takes roughly 4hrs hours to prep and replace one complete system if all goes to plan (this is if we do not have to reset mooring plates or pins). Cutting chain, splicing and whipping pennants, prepping dive gear, measuring depths and swing room, removing the old mooring system, are all part of the tasks involved in replacing the moorings. Typically, once on station at the mooring, the replacement process takes 1 person on the surface to prepare the new mooring system / supply tools / take care of the vessel, while 2 divers work closely at the seafloor to safely remove the old system, inspect the in-ground plate or screws, verify measurements and vessel swing room, and then install the new mooring system. ECLSP entire northern mooring field. One complete mooring setup costs about $2,500 to install. Please do visit our website https://bnt.bs/supporteclsp/ , watch our new video that showcases our beautiful Land & Sea Park, and consider making a donation in any amount- or better yet, making a donation to install a complete mooring system. We truly do appreciate the support and your help in allowing us to protect our beautiful marine habitat. Reminder: When taking up a mooring, please avoid using balls designated for large yachts (marked ‘150 max’ or ‘100-150’) whenever possible so that these larger vessels can have the option to moor as opposed to anchor.